The Mechanics arrived with so many players unavailable that manager Dave Worthington was forced to make eight changes from the team that started against Holker Old Boys – and could only name three players on the subs bench. There was a debut for new signing Jack Webster at left-back as well as a first start for Callum Gellatly, Cian Menzies and Jack Sharples. Clinical finishing from the home side in the first half an hour saw this game over early despite a spirited performance going forward from a young and relatively inexperienced AFC team. Within seconds of the kick-off, the home side found a breakthrough through striker Leigh Dunn. It soon became 2-0 with Dunn once again finding space and the back of the net in the fourth minute. AFC gradually got themselves into the game, but it became worse in the 28th minute when the home side added a third goal through Stuart Shaw. The visitors had regrouped by then with versatile midfielder Mike Hall, filling in at centre-half, driving his team forward. A free kick on the edge of the box had to be pushed away by home goalkeeper Craig Rule, another effort was deflected past the post and a further attempt from 18 yards was just wide. AFC came again and continued to create chances but the home side maintained their 3-0 lead into the break. The second period began with an early save from AFC goalkeeper Alex Cameron but it was the visitors who would begin to dominate the rest of the half. A corner won through sheer determination was headed just over by defender Dan Mottram before Jack Taylor made it 3-1 in the 70th minute, applying a close-range finish to a left-wing cross from the impressive Menzies. Buoyed by the goal, AFC continued to swarm forward and, soon after, hit the underside of the bar from distance. With AFC fully committed to attack, the home side added a fourth a minute from the end through Liam Johnston. 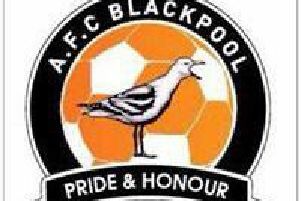 AFC Blackpool: Cameron, Betteridge, Dickson, Hall, Taylor, Webster, Gellatly, Menzies, Mottram, Pickering, Sharples. Subs: Thomason, Fishwick, Finlayson.